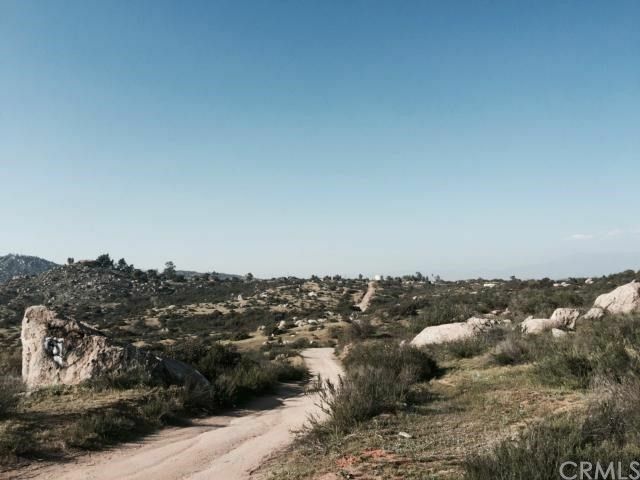 TEN 10.31 ACRES of RURAL VIEW PROPERTY ON A CUL-DE-SAC in SOUTHWESTERN RIVERSIDE COUNTY! The fastest growing County in California. Fantastic & extremely private land is located just North of Highway 74 only 5 miles East of the I-215. Build your families dream home on this very out of the hustle & bustle parcel. Make this your families compound that could be completely "OFF THE GRID", even though the EMWD water tank is just North & SCE power lines are just South of this lot. Connect to the utilities or decide to wait until neighbors connect! Solar, wind, propane, water tank, well property! Plenty of space to build your home or put a mobile home on this 660x680+-lot, leaving room for garages, out buildings, stables, barns, plant a garden, orchard or grapevines! Lots of room for toys for the entire family. NO HOA, so you can enjoy your lot as you would like to without worrying about the rules. Lot is very private, yet is minutes to convenience shopping stores, schools, churches, restaurants & recreation. New AMTRAC! New development area, located within the Hub of the Golden Triangle. Easy access to the I-215, I-15, Hwy 74, & 70 & the 10 & 60 Freeways. INVESTMENT BUILD or HOLD! LANDBANK in your families portfolio to insure your families financial security! BUY LAND!